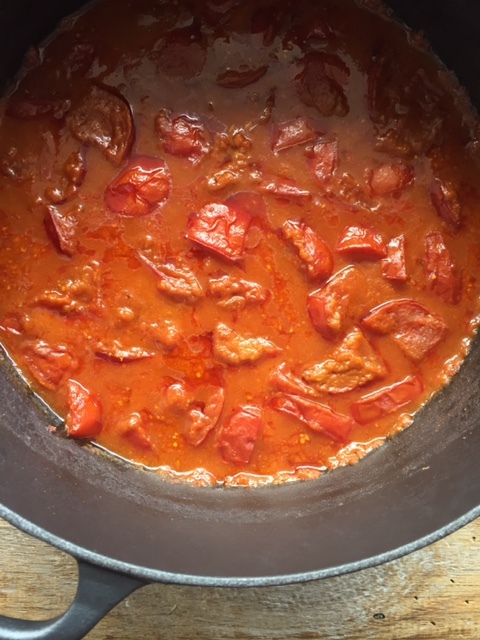 This Indian curry sauce first appeared on Feast Wisely earlier in 2016, when I discovered it as part of a recipe for chana masala by Rick Stein. Since then it’s become a regular part of my Indian feasts, but each time it presents itself very differently. That’s because the sauce itself is super adaptable – and works as a fantastic base for many Indian curries. 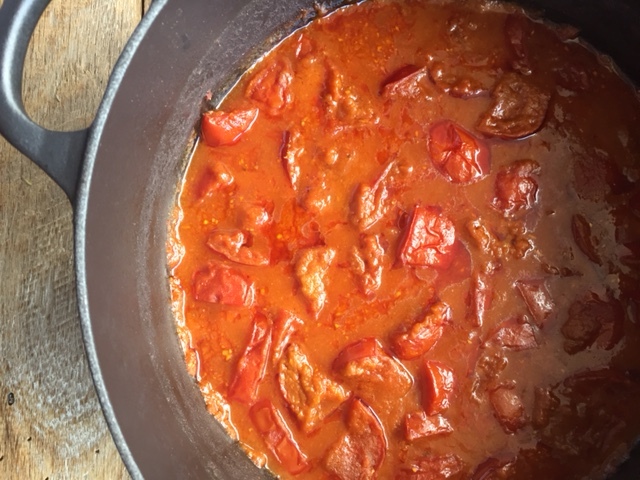 What I love about this sauce is the ginger, garlic and onion base, the mainstream spices and the heavy hit of tomatoes – all of these ingredients are packed with health promoting properties. Whether you add legumes and vegetables like me, or white or red meat, this really is a sauce that produces a crowd pleaser curry every time. Along with the recipe I’ve included some top tips, like preparing a double or a triple batch and then freezing portions for later use. That way, on a busy weeknight, you can use a defrosted batch with some quick cooking veggies or tinned legumes and you’ll have a made from scratch curry ready within 20 minutes. On another note this will likely be my last post for 2016 – I’m looking forwards to a long break from work over Christmas and New Year and have decided to also take Feast Wisely break – it’s part of my quest to switch off from all things digital and enjoy a couple of good books…..so Happy Christmas and New Year and see you in 2017! Roughly chop the garlic, onion, ginger and chillis and then blitz them into a paste in a blender. Heat the ghee or oil in a pan over a medium heat and cook the paste for 5-10 minutes. Stir in the tomatoes, salt and water. Bring to the boil and reduce to a simmer. Cook for as long as you can – I personally cover the sauce and transfer it to the oven to cook for 2-3 hours at 150C. But you could also simmer for as little as 30 minutes accepting that the end sauce won’t be as rich. Stir through the garam masala and lemon juice a few minutes before the end of the cooking time. Your sauce is then ready for use. Based on my 2016 experimentation here are some vegetarian and vegan suggestions on what to add to the base sauce. Blending the onion, garlic and ginger into a paste (versus chopping) gives the sauce a smoother texture and more flavour. If you can make your own garam masala spice blend then do – it last for weeks and adds a wow factor. Try the slow cooking time of 2-3 hours – it reduces the sauce and gives the spices time to shine. Tailor the amount of chilli to suit the tastebuds of your audience – it won’t be a crowd pleaser if it’s too hot. Prepare a double or a triple batch and the freeze portions for quick, but impressive, weeknight meals. Instead of water try the reserved juice from tinned legumes (eg aquafaba) or use chicken or vegetable stock. Tags: curry, Indian, recipe, sauce, tomatoes, vegan, vegetarian. Bookmark the permalink. Have a great Christmas, a lovely break and a happy new year! Thanks Elaine and same to you too! Vegan daughter has just arrived so this is timely. Have a lovely festive break. Thanks Sally – I am sure she will love any vegan curry with this easy sauce as a base! Amazing sauce Laura. Wishing you a Merry Christmas and Happy New year. Happy new year! And what a gorgeous curry! I love your tips about freezing some for later use! Thanks Nell – and yes I just made another 4 batches which are now in the freezer and will get me through January!